Hi! Привіт! This is something I will put out there to those wanting to learn Ukrainian on Duolingo. I will of course post these directions later on before release for those starting the course. These are the instructions for downloading a Cyrillic keyboard for those who want to get ready for the Ukraine course release. The Cyrillic keyboard layout is a challenge to get used to so the best advice I can give you is just practice, practice, practice! 1: Go to your start menu and search the word "Keyboard Input". 2: Select the one that says something along the lines of changing your input options. 3: A window should open called "Region and Languages", click the button that says "Change Keyboards"
5: Make sure before you are done to click "APPLY". Buy keyboard stickers for your computer. (preferred) Turn on the "On-screen keyboard"
Search "On screen keyboard" in the start menu. Click on "On-screen Keyboard" and it will pop up. If you want to hot key your keyboard to switch between languages: get to the window where you would add another keyboard language, click on "Advanced Settings", and then click on "Change key sequence". Then when ever you want to change between language keyboards just hit your selected key(s) and it will switch input. You can move the virtual keyboard around like any other window. The keyboard will remain visible at all times unless you exit out of it/minimize it. There is also Google Input Tools, which is a browser extension, which enables typing in other languages. Thanks! A great thing to do in advance of the lessons. For Russian Cyrillic there are generally two kinds of keyboards available, the "homophonic," which has the keys arranged as much as possible as on an English keyboard, and the "standard" keyboard, which is like the arrangement for old Soviet typewriters. Neither is very hard to learn, but the homophonic is easier to learn. Once you are in practice with either one, there doesn't seem to be any advantage for one over the other. Unless you have to type on an old Soviet typewriter, of course. It is probably the same with the Ukrainian keyboard layouts. In my experience, phonetic keyboards are easier to get used to than the standard ones. All Cyrillic letters are mapped to their most logical English equivalent. For example pressing l produces a л, which is the closest equivalent in Ukrainian and Russian to an English sounding l. There are still a couple of keys you need to learn that don't have a phonetic equivalent like pressing q for я (sounds like ya), but you'll probably pick it up much faster (probably within an hour if you're already familiar with the sounds). By the way, I once made a pretty long post with keyboard advice for people wanting to learn Ukrainian, Russian or even both. It compares phonetic keyboards, Google input tools and the official keyboards. It can be found here. TypeRacer has helped me a lot to practice typing with a new keyboard. It's not the most modern interface, and the translations are probably really terrible, but it's a great way to get practice "racing" to find the keys. After using it, I don't need stickers or an on screen keyboard; I can type without looking just like I do in English. Is there a shortcut for the letters ґ, і, ї, and є. I'm used to the Bulgarian layout and switching to the Ukrainian one is almost imposible for me to use. The problem was that Bulgarian Cyrillic doesn't have those four characters. I made a custom layout and put them in the place of some punctuation button, so it should work hopefully. Instructions for Mac... If someone wants to add these to the original post, feel free! Open Spotlight (type COMMAND + SPACE) and search for “keyboard”. Select the one that says “Keyboard, System Preferences”. The System Preferences app will open. Click on the “Input Sources” tab. Click the “+” button in the lower left corner. Select “Ukrainian” or "Ukrainian pc" (your choice) and click “Add”. That’s it! Now to switch between your Ukrainian and English keyboards, just click on the flag in the menu bar. However, it can get frustrating to have to go up to the menu 20 times throughout the lesson just to switch keyboards. ;) Please use the following steps to setup key commands to switch between your Ukrainian and English keyboards. Open Keyboard preferences again (original steps 1 and 2). This time, click on the “Shortcuts” tab. Click on “Keyboard Text Input” in the sidebar. Now these last two steps are very important! The first command will switch to the last keyboard that you used. The second command, however, will cycle “down” through the menu. If you press and hold down the keys for the first command, you will see a pop-up menu in the middle of your screen, which you can use the arrow keys or COMMAND to navigate. Thank you so much for this! What is the difference between the Ukrainian and the Ukrainian (Enhanced)? Just found this out while doing some typing training for the Ukrainian layout. In the standard Ukrainian layout, the (~) key in the top left is a Russian (ё). In the Ukrainian (Enhanced) layout the (~) key becomes a ('). This is way more beneficial because it saves time from using the ALT+39 combo to create the same symbol, like when typing words like п'ять, м'ясо, зап'ясток або дев'ять. I use a translit-type keyboard layout on my Mac for Russian (it works pretty much like translit.net) and it works extremely well. I can also adapt it to Ukrainian very easily, if anyone is interested. Do you mean the pre-installed phonetic Russian keyboard? For those already familiar with this keyboard, you can use the option (ALT) key for the specialized Ukrainian (and Belarusian) letter(s): ALT + и = i, ALT + э = є and ALT + а = ї. For those interested in Belarusian, ALT + у = ў.
it can be modified into a Ukrainian layout fairly easily. It works! Haha, I can change my keyboard! йщшгуефл діварббьфиуі ийцушеенб, I don't know what the hell I wrote but it's cool. The onlly problem is that I can't not see wich letter I'm typing, but I don't thing that I'm going to buy some stickers. There you can transliterate latin alphabet to Russian, Ukrainian, Belarussian cyrillic and other writing systems like e.g. Armenian or Georgian. I use both and they each have their pluses and minuses. I've downloaded the keyboard successfully :D , but I've noticed that the button for letter " Ґ " is missing from my keyboard. :/ I hope that is not my fault. But I've done my homework and found out that the combination ( Right Alt* + Г ) solve the problem :D .
* Only (Right Alt) like the "US International" keyboard. Thanks... I looked all over trying to figure out how to type a Ґ. 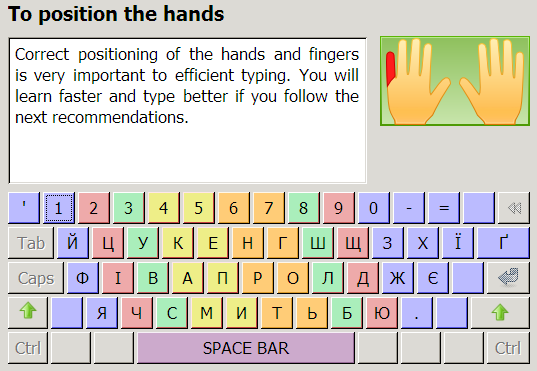 For those running Linux (Ubuntu) I worked out how to get a working Ukrainian keyboard. 1.) Go to "All Settings" and then "Keyboard" 2.) Under the "Layout Tab" put Ukrainian as another language and select a key to toggle between languages. 3.) Install "Onboard" from the Software Centre. and run it. This should display an on screen keyboard. 4.) If you toggle between your languages on your physical keyboard, the on screen keyboard should follow and allow you to type in Ukrainian. But if you want to type in English from your physical keyboard you'll need to toggle back and forth between the languages. Hi I have created a browser plugin to change the keyboard layout automatically. Optionally a layout of that keyboard can be shown to assist in learning the layout. For Ukrainian I included the regular and a phonetic layout. Google Input Tools is perfect for me :) Since I might not use Ukrainian that much and I already got 4 languages on my windows keyboard. Now, I have a problem with this keyboard, I don't know where ы is located. Can anybody tell me please? The letter Ы occurs in Russian but not in Ukrainian: https://en.wikipedia.org/wiki/Yery. Is it on the "s" key? Nope, it is ы on a Russian one, but it is "i" for Ukrainian. I use Ukelele (http://scripts.sil.org/cms/scripts/page.php?site_id=nrsi&id=ukelele) for the Mac. You can customize it any way you want, so I made it phonetic. The page linked to has information about how to set it up. I use the on-screen keyboard viewer that comes with the Mac for remembering where the keys are. ⌘-space switches quickly between US and Ukrainian layouts. On a Mac, once you have it set up for Ukrainian if you click on the flag in the top right you will see on the drop down menu "Show Keyboard Viewer. Select that and a copy of the keyboard will show up on your screen. This serves as a good guide for finding the characters. Also, there is a versatile basic typing tutor called aTypeTrainer4Mac. It is free and easy to use. You can choose any language that you have set up. I used it for the Dvorak keyboard, but checked and it works for any language (maybe not Chinese or Japanese—I didn't try these). Is this yet available for MAC? I have a problem with my existing Ukrainian keyboard - it doesn't have an apostrophe. I need to mention this. I was happy to find and install the Ukrainian language on my keyboard settings. I use a PC, and it was available on Windows 10. However, I made a big mistake and left the checkbox checked for "Install and make my default language". It was confusing because I thought if I didn't have it checked, it wouldn't install at all. Anyway, I left it checked, obtained a keyboard, and began using my On-Screen Keyboard. I turned my computer on the next day and found all of my operating system was stuck on Ukrainian. I mean everything. My settings were all in Ukrainian and I had to rely on icons and memorizing where certain things were to click on them. For a good couple of hours I was really stuck until I finally calmed down, and tried to use the Ukrainian I learned here to get me out of it. Get this: On Level 9 Ukrainian using Duolingo, I managed to make sense of the alphabet to sound out words, and those closest to English like "format" and "admin" stood out. With what little I knew, I got to an admin section and found English and IN ENGLISH it asked me if I wanted to make it my default and I clicked yes, of course. It said it would take effect upon my next restart/reboot. Well, that had to be what happened when I went the whole day enjoying my Ukrainian keyboard on an already English operating system. I implore you -- if you do install the keyboard, do NOT check that box that asks if you want to make it your default language. I'm not saying don't install the new language to your keyboard, if my response is scaring people. Please, by all means do it, as it really helps with the course, but just pay attention to what you are doing. Also toggle back and forth on your On-Screen Keyboard with Left Alt + Shift. Online, you can also find Ukrainian keyboard transparent stickers if using the keyboard interests you. Good luck, and please be careful! I don't wish what I went through on anyone.